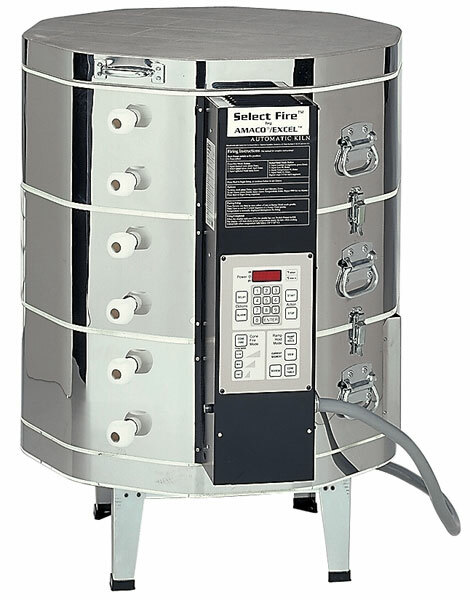 Amaco's Model EX-1099 is designed for production, with a giant 9.9 cubic feet of interior volume in a giant firing chamber that is 28" in diameter and 27" deep. A true Cone 10 kiln, it must be wired directly by an electrician with a high amperage circuit and heavy gauge wiring. Use only the full 1 inch shelves for Cone 10 firing. An EZ-Lift™ lid, as well as a Select Fire™ Controller, is included. External dimensions are 38"W × 33"D × 43"H, including the width of the control box and the height of the 8" steel stand that is included. The kiln weighs 290 lbs, and shipping weight is 410 lbs. 2 year warranty.